Laughter and music are always best antidote for whatever troubles you might be facing. Spring was full of smiles for our Artists and management team. It has been very busy at Friendly Folk Records and our parent company My Music Matters Management Triad. Scroll through the posts on this website for all the details, but for those who prefer the recap of the April - June happenings, we present to you our 2nd Quarter-2018 Newsletter. Jyoti Verhoeff kicked off this season with her Touches Radio-Livestream Tour. Interviews combined with live music shows at least once per month from April right up to day of full album release, scheduled for 27/September/2018. If you missed any of the radio or livestream shows, click Jyoti's Facebook link HERE for the replay. Greenrose Faire digital release (Single) Never Walk Alone was released just a few days before the band's return to the kingdom of Elfia Fantasy Festival in Haarzuilens, Netherlands. Coincidentally, the theme this year at Elfia wass: 'you'll never dream alone'. We love coincidences. Download the music on your favorite digital platform HERE! As for Elfia Fantasy Festival, there were smiles, hugs and laughter enough to last a lifetime. The band performed both Saturday and Sunday and warmed the hearts of new fans and old friends. If you missed the performance, get out to Elfia Fantasy Festival in Arcen (September/2018) as Greenrose Faire have been invited back to enchant and entertain. Naturally, we took the opportunity of showcasing our Finnish family while they were in Netherlands at our second label event of the year, Friendly Folk Fest - Elfia Pre-Party. It was a special treat to host this event featuring two headliners, Greenrose Faire and our friends of Friendly Folk, Harmony Glen. It was hard competition for fans to choose between great music and the beautiful weather. Who expected sunshine in April? Therefore, we would like to thank all who came out to enjoy the music and fellowship. Alongside the Artists who are already signed with Friendly Folk Records, we have a few bands waiting in the wings at My Music Matters-MT, as they are not quite ready to release new music yet. During the Elfia Fantasy Festival, we were very pleased to see not only the band of Sassenachs performances, but also that they were there with the full encampment. If you have ever been curious what a historical Scottish military camp felt like, visit one of the many entertaining shows of Clan Sassenachs. You will find them under the Scottish flags at many festivals in the Netherlands. Click HERE for interview with Sassenachs. You will also hear the music of Sassenachs featured on this Elfia video. 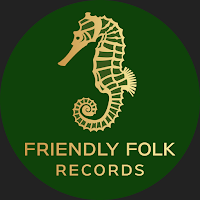 We are getting excited to officially sign them to Friendly Folk Records with their upcoming cd, perhaps even a double cd, later this year. Max Bianco launched his first tour of Netherlands (10/May - 23/May) where he promoted his new singles, 'Northeast Bay' & 'H-Town Blues', released worldwide digital distribution May/2018 via Friendly Folk Records. You can download the music HERE! Naturally, while Max was in town for his first Friendly Folk Records tour, we had the perfect reason to host another Friendly Folk Fest. Since the theme of the festival was Balfolk, Max adjusted his songs to fit the happy feet of our Balfolk Dancer friends. In addition to friends of Friendly Folk co-headliner Andoorn, and support act Fiddle & Drum, Max was joined by My Music Matters-MT Artists, The Flask for a jam session finish! In addition to the FFR fest, Max performed at several clubs, pubs and festivals during his stay. Special thank you to all of you who came out to support Max on his first Netherlands tour. Jyoti Verhoeff and Max Bianco were co-headliners at our first event with A-Broad Studios. Intimate Sessions concept was created by Kathy Keller (My Music Matter-MT) and Paul Visser (A-Broad Studios) along the lines of the world renowned Sofar Sounds: intimate concert with limited seating, a place for music lovers to enjoy music without background chatter and clanking beer bottles that dampen live music experience at clubs. The afternoon was a success, with open tours of the studio and artist/public interactions. After the shows, it seemed that Jyoti and Max had a chemistry and decided to create a song together. We will keep you updated on progress of new music adventures of these two talented Artists. Greenrose Faire kicked off the first day of June in royal fashion with the release of their highly anticipated fourth studio album, Riders in the Night. Available on all your favorite digital platforms. Click HERE for direct access to Spotify, itunes, Deezer, Google and more. Physical CD shipped worldwide via Friendly Folk Records & Artist's Webstore. Max Bianco hit the road 15/June on his way to Germany and beyond. Following the path of a true troubadour, Max will follow his dream of roaming from village to village sharing music and merriment on a three month 'walk-about'. Look out Germany, Netherlands, Italy, Switzerland and Belgium.... here comes Max! - If you missed our Newsletter for 1st Quarter 2018 (Jan - Mar), click HERE!